The secret of how the cold sore virus manages to persist for a lifetime in the human body may have been cracked by US scientists. 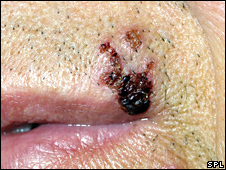 The herpes simplex virus 1 (HSV-1) can lie dormant in facial nerves, emerging periodically to cause sores. A Duke University Medical Center team may have uncovered how it can reactivate itself from a dormant state. The finding, published in the journal Nature, could eventually lead to new treatments. When fighting a virus, the immune system relies heavily on the protein chemicals produced by the virus which it uses to help mark it for destruction. Herpes viruses manage to evade the immune system by shutting down production of these proteins completely, and remaining in this state for long periods before starting to replicate again. This is why patients, once infected, have occasional flare-ups of cold sores or genital herpes, and can never get rid of the infection completely. However, there is one thing that HSV-1 does produce, the precise role of which has puzzled scientists for some years. It is a type of RNA, a single strand of genetic information copied from the DNA of the virus. In other viruses, these RNAs make proteins that are useful to the virus, but in herpes, this was not the case. The Duke University team suspected that it somehow helped keep the virus in its dormant state, and studied what happened to these "latent RNAs" in mice. They found they were broken down into even smaller strands, called microRNAs, and these appeared to block the production of proteins which reactivated the virus. Effectively, they were helping keep the virus in its dormant state. Professor Bryan Cullen, who led the research, said: "We have provided a molecular understanding of how HSV-1 hides and then switches back and forth between the latent and active phases." He said a drug based on blocking these microRNAs could in theory "wake up" all the viruses, making them vulnerable to antiviral therapy, and raising the possibility of a cure for herpes. Professor Roger Everett, a Medical Research Council virologist based in Glasgow, said that the research represented a step forward in a "long-standing problem" in the field. The next step, he said would be to see what happened in an animal using a virus engineered to block production of these RNAs.